I'll celebrate my 100th post by continuing in the same vein from Monday: hermeneutics. Literature on the topic of hermeneutics swelled in the late eighties and early nineties. We may be in somewhat of a reprieve, but it is still a very important topic to discuss and understand. One aspect of the topic which can sometimes be neglected is its theological history. For instance, what did our Puritan predecessors have to say about how one interprets the Bible? Sometimes the answer may be surprising; take, for example, Amesius. 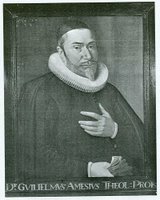 William Haller, Puritan scholar, once said that Guilielmus Amesius (Eng., William Ames) was the “architect of Elizabethan Puritanism.” He conducted theological debates with many of the Remonstrants in Holland, and, apparently, thoroughly worked through his theology while doing so. Amesius’ Marrow of Theology was the standard text in Reformed schools for decades to come, especially in New England, where it had a profound influence on Edwards. I found what Ames had to say on hermeneutics intriguing and helpful. "There is only one meaning for every place in Scripture. Otherwise, the meaning of Scripture would not only be unclear and uncertain, but there would be no meaning at all -- for anything which does not mean one thing surely means nothing" (The Marrow of Theology. John Eusden, ed. Boston, p.188). Thank you for quoting Amesius' words" "There is only one meaning for every place in Scripture." As a student of the Bible it is truly refreshing to "hear" scholar/poets express or capture the truthfulness of a matter with profound clarity using the simplest of words. Without this law of "non-contradiction", regarding what I believe to be the Word of God, we would be left with nothing. For one to find truth in scripture is to be set free from the lies, the "mysteries" and confusion found throughout Christendom. Jesus said to those who claimed to be followers yet proved false to his teachings: "get away from me you workers of lawlessness". Their aim seems to be to bring down the name of the "Father of the Celestial Lights" while glorifing the creation rather than the creator.